Sift the flour, add baking powder, baking soda, salt & cardamom powder. Mix well to ensure that there are no lumps. Mash the bananas well & add the vanilla essence to it.Add the beaten egg along with sugar & oil and mix well. Add to the dry ingredients.Add the chopped walnuts and mix well to bring everything together. 2/3rds to the top. Sprinkle chopped walnuts on top of each cup. Bake at 350 degrees F for about 20 minutes. Check for doneness. A toothpick inserted in the center of the muffin should come out clean and at this point the muffins turn a beautiful golden brown color. This recipe yielded about 12 muffins. Muffins are best served warm. I love to have this for dessert with a little bit of whipped cream on the top ! Once muffins used to be my favourite breakfast. Looks yummy !!! and lovely photograph. Makes a great breakfast,doesn't it? Looks yum!! hey, the muffins are so tempting :) liked ur corn salad as well, good going! these are divine. I too have made them in my blog but I dont add eggs!! your pic looks awesome. You have a lovely blog here. Thanks for visiting my blog which lead me to yours. you have a good coolection of recipes ! Sharmi, thanks. I just checked yours too.. looks so good! Sure, I'm all ready for the exchange! BTW, your sketches are just beautiful! Roopa, thanks for the kind words. Do try making them.It does not involve much work at all. 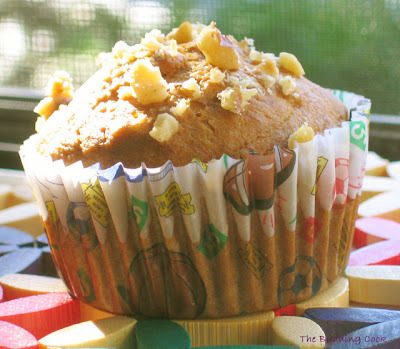 I started making these only recently.I am going to try a slight variation, your apple muffins soon. the muffin looks so good! Banana-walnuts are a favourite combinations. Haven't added cardamon to mufins before. Will try now. The muffins look delicious! thecooker, thanks for stopping by.Cardamom gives it a nice flavor. Do try it & lemme know!